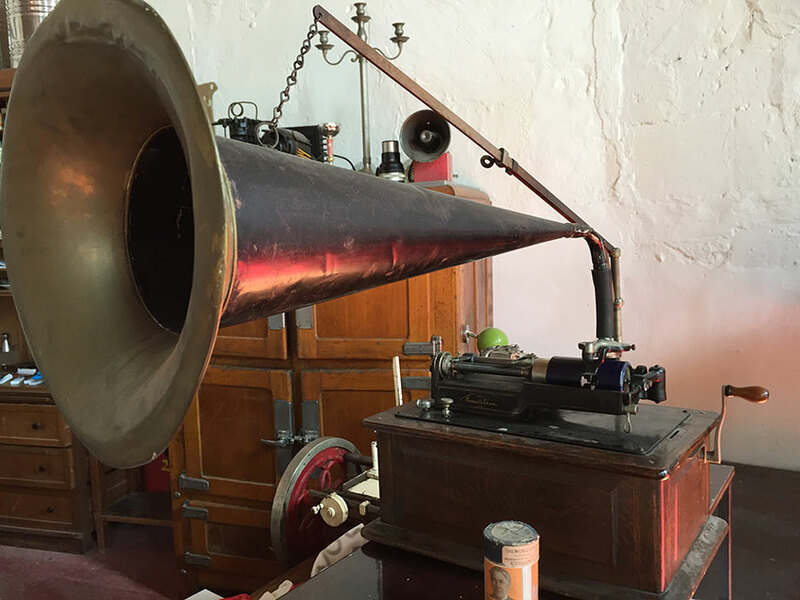 Among the numerous old objects of the Domaine du Meunier, the Edison phonograph of the beginning of the 20th century , sits proudly on the stage of the Salle Parias Frères. Thomas Edison is the inventor with 1200 patents registered. Among the most important objects that mark the history : The incandescent bulb and the phonograph. In 1857 the french Léon de Martinville looked for a way to record speech and he invented the phonautographe. 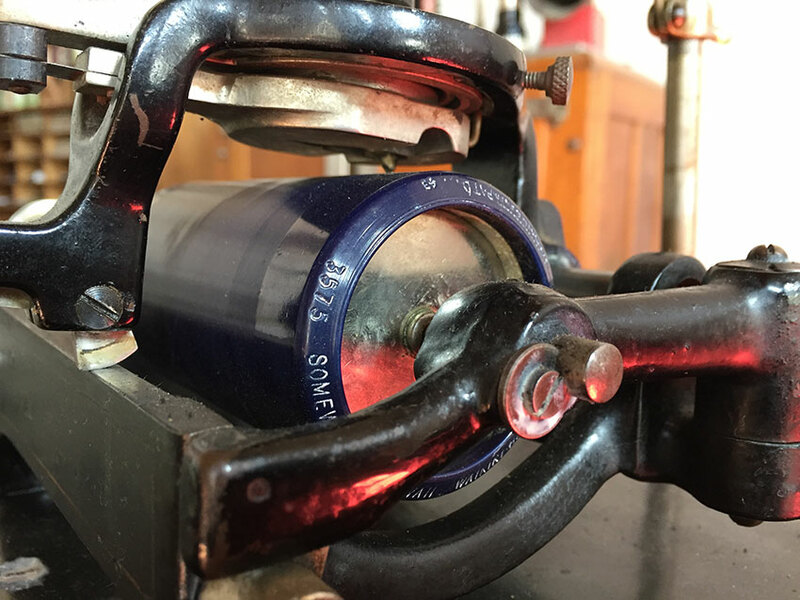 The device already has all the elements that will make the success of the Edison machine : a cylinder on which the recording will be engraved, a diaphragm that reacts to the sound and a stylus. Thomas Edison improved the machine and in 1877 he filed the very detailed patent of the phonograph. He planned many applications for his invention : recording books, letters, telephone answering system, incorporation into toys… The success of his device is great but brief. It’s only in 1888 that Edison improved his phonograph and the new version marks history in 1889 as one of the main attractions of the Universal Exhibition of Paris. The operation is relatively simple. The machine got a cylinder rotating around an axis, a recording diaphragm and a reading diaphragm each one provided with a stylus. The recording is done on a simple sheet of tin. During the recording, a crank is turned which activates the cylinder, then someone speaks in the vicinity of the horn. The sound waves vibrate and the recording diaphragm which is connected to the stylus and the stylus engraves the tin. Then there is a more or less creative pattern on this sheet that is called a phonogram. The reprography is made from this recording on a wax cylinders which will allow a listening of 2 to 4 minutes. The Edison Blue Amberol cellulose cylinder is used from 1912 to 1929. When the phonogram is read, the drive pen follows the groove and vibrates according to the engraved pattern. These vibrations are transformed by the diaphragm into sound waves and amplified by the earpiece. Very often, the stories of old objects begin in the attic. 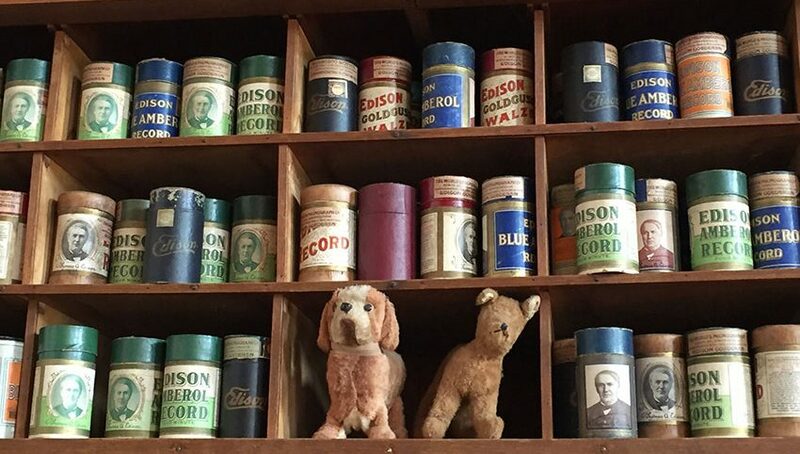 One hundred Blue Amberol cylinders were stored in Coen’s grandparents house. For years the Ter Kuile family was looking for an Edison phonograph to read the cylinders. A friend of the family who worked in a auction house reported that a Edison had been purchased but was never collected. It’s by this way that the music of the phonograph could be heard in the house ter Kuile. The Edsion phonograph of 1912 B series now allows to listen American, German and French music including one about the shepherd of the Pyrenees! In 2015, for the 50th anniversary of Coen, his mother offered him this beautiful object that allows us today to dance in the Salle Parias Frères as proves this video. Partager la publication "The Edison phonograph"